For years, StFX religious studies professor Dr. Adela Sandness has developed scholarship, skills and expertise in mindfulness: thoughts and more as seen in the ancient Indian world, as they would become part of Buddhist psychology and a whole way of understanding the world that is non-dualistic in its thinking, in that it is “both this and that,” in a world where time is round. 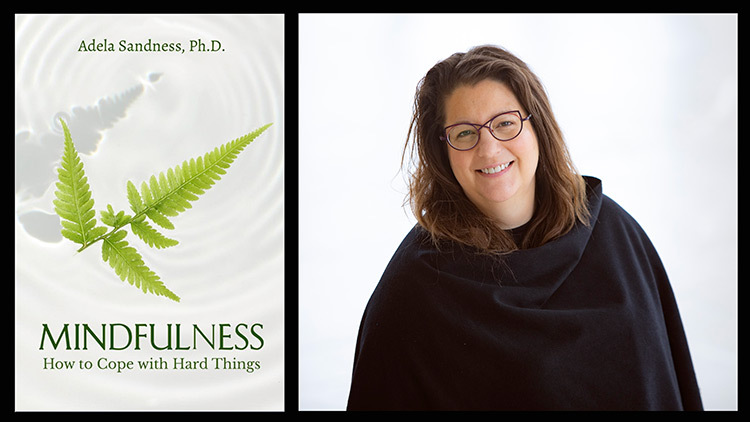 Now, drawing on decades of extensive scholarship and practical experience, Dr. Sandness has published two new books, Mindfulness: How to Cope with Hard Things, and its companion book, Mindfulness: How to Cope with Hard Things: A Workbook; launched a website and weekly podcast, Just Breathe…You Are Enough; and in September 2018, started offering a series of seven classes in a “Mindful Living Stream of Study” at StFX. Of the seven courses, four are refreshed offerings and three are new. She says they treat relationships, gender, race and power dynamics, leadership and de-colonization, and stewardship of one’s own mind and body all in a way that takes as its basis that life itself – and all who live it – are worthy of honour, dignity and respect. Dr. Sandness says requests from students and others prompted her to reframe her classes to provide scholarship in a way that is more applied, as well as offering formats available to a wider public. She says she wanted to offer a more in-depth look at where the mindfulness movement comes from and how the paradigm of thinking from which it arose can help find new answers to old problems. “It’s a way of seeing the world that is very ancient, but at the same time utterly contemporary,” says Dr. Sandness, who notes that people today are still grappling with similar questions as those in the past. Dr. Sandness certainly brings a unique world view to her work. Educated at the École Pratique des Hautes Études of the Sorbonne in Paris with one of the world’s top scholars in the field of Vedic Studies, she holds a PhD with mention très honorable avec felicitations du jury, the highest academic distinction awarded in the French university system. She further developed the research methodologies of the Moscow-Tartu School of Semiotics taught to her by Tatyana Elizarenkova, considered the world’s greatest Rgvedic scholar of her generation. Additionally, Dr. Sandness developed skills through a decade of leadership roles in mindfulness practice communities—including two years of practice living in a Buddhist monastery—and a close, over decade-long relationship with an English-speaking Buddhist monastery. The first of her “Mindful Living Stream of Study” classes offered this fall proved popular. The course, “Mindfulness: How to Cope with Hard Things” had 45 students the first day of class, and, by word of mouth, it had 75 students the second day of class. Its companion class on the body had 46 students the first day of class and 66 students the second day of class. Her “Mind, Self, and Society” course has been another popular option for the past number of years. Offered intentionally through StFX Continuing and Distance Education it includes three weeks of online study and a one-week immersion experience at Gampo Abbey, a Tibetan Buddhist monastery on Cape Breton Island where students are able to live the lifestyle for the week. Reviews of the work have been positive. “Unlike many other contemporary manuals on mindfulness, this is not a composite of neuron counts, plasticity measurements and stress charts. Adela Sandness’ work places mindfulness within the mytho-poetic world of the ancient Hindu Vedas and the inner cosmology of classical Buddhism. At the same time, it is born of her experience of working directly with the compound emotional and cognitive challenges of today’s students coping with an increasingly troubled world,” writes Richard Reoch, Chair of the Board of Trustees of The Mindfulness Initiative, United Kingdom. Dr. Sandness says as a scholar of humanity, she feels she has a responsibility to contribute to her field, but also to participate in public discourse, to play some part in protecting and defending the quality of our humanity. She says all the work is offered with philanthropic intent—a portion of the proceeds will be donated for use as student bursaries at StFX.